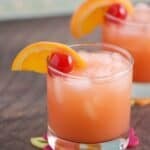 Brighten your cold winter days with a Caribbean Rum Punch! It's the perfect cure for shoveling snow and braving freezing cold temperatures outside. Pour all ingredients into a cocktail shaker and shake well to combine. Serve over ice in a short cocktail glass. Garnish with an orange slice an a cherry. Chill the pineapple and orange juices ahead of time so your ice doesn't melt as fast. Angostura Bitters are found on the top shelf of the mixers aisle in most grocery store liquor departments. For a spicier cocktail, use spiced dark rum.